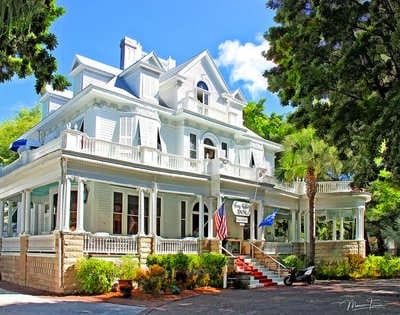 Amsterdam's Curry Mansion Inn is conveniently located close to The Ferry Terminal and Duval Street. Everything is included in your room rate, full made to order breakfast, two hour daily cocktail party with open bar and snacks and live entertainment, Wi-Fi, parking, Laundry and more. Never a Resort Fee! Please check our reviews on Google or Trip Advisor. The history of Key West comes alive when you choose on of the 28 rooms at Amsterdam's Curry Mansion Inn. The owners live on the property and are there to help make the most of your time in Key West. Enjoy an extended stay on the property right up to your ferry departure time. Take the free Duval Loop bus from the Ferry Terminal to the Curry Mansion. We are located on Caroline St just 56 steps from Duval St.